Pop up truck campers are just like traditional campers, in that they are slide-in units designed to sit in truck beds. These campers are perfect for truck owners since they leave the hitch free to tow a boat, ATV, cargo trailer, or anything else. They can also be lifted up off the bed and then lowered down once you reach your destination, which allows you to leave the camper in place when you head off to a trailhead or want to go fishing. While most campers are heavy enough to require a heavy duty, full-sized truck, there are a number of manufacturers that produce lightweight units that are suitable for smaller trucks. Pop up truck campers tend to be the lightest of these featherweights, and they also have the added benefit of allowing for better aerodynamics. Some of these campers don’t even extend above the roof of the truck cab when folded down, which can help with gas mileage in comparison to traditional campers. Other pop up truck campers do have cabover extensions, which provide additional storage or sleeping space. Pop up truck campers are lower in profile than traditional truck campers. While smaller, towable pop up campers are great for campers who don’t drive trucks, pop up truck campers provide true versatility to those who drive trucks. Rather than towing a travel trailer, tent trailer, a-frame, or other pop up, and just using the bed for storage, pop up truck campers free up the hitch for other uses. That’s great for anyone who has a boat, ATV, cargo trailer, or anything else they like to take camping. Like towable units, pop up truck campers are available in a number of different styles. Most of them have canvas sides that cover the pop up expansions, but there are also a number of rigid-sided options, including a-frames and straight pop up units. Others come with cold-weather modifications that make it easy to seal up the canvas sides for winter camping trips. There are a few unique issues to consider when looking at truck campers. Weight is a huge factor regardless of the type of pop up camper you’re buying, since it’s easy to overtax the engine and transmission of a small car by towing a load that’s too heavy for it to handle. This is still a consideration when it comes to pop up truck campers, since light trucks just aren’t designed to carry heavy loads. Even if there is room in the bed for a camper, components like the brake calipers and rotors might be undersized to handle that type of load. That’s why it’s vital to verify that a truck is rated to carry the proper amount of weight before loading it up with a camper. The other main factors to look at are bed length and the space between the wheel wells. 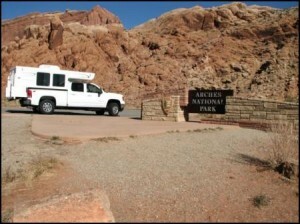 There are a lot of great campers out there that are designed for “short box” trucks that have shorter than average beds, and there are also a number of pop up truck campers that are designed specifically for imports that have narrow beds and various trucks that don’t have a lot of space between the wheel wells.